The driver in the pickup truck to my left was furiously beeping on his horn. He drew even with my driver's side window and beeped again. I looked over ... and he flipped me the bird. What the? ... then I understood. He was demonstrating his respect for my choice for president. 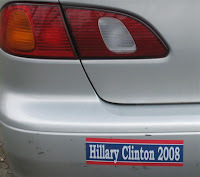 He had noticed my Hillary Clinton for President bumper sticker. And we complain about the uncivil partisan tone of our elected representatives?